IntelleVue brings over 25 years experience in demographic analysis, site location analysis and franchise territory development. We offer turn-key services in the analysis, development, mapping, and reporting for franchise territory building activities. Charged by the hour, no project is too small or too large. 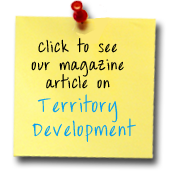 We can development maps and reports for a single territory or develop an expansion plan by developing territories for a state, region or the entire US. The remote desktop system subscription provides full mapping functionality to those clients who prefer to control the mapping themselves but removes all hardware and software issues. IntelleVue maintains the system and updates the data, removing all client IT support issues and problems. FranchiseVue is a web-based subscription service that helps franchisors manage franchisee territory opportunities and solve problems commonly associated with identifying and communicating existing and available territory geography. Provides a web portal with access to all franchise territory geography – including sold, pending and proposed territories with key demographic data. Provides the user the ability to select multiple Zip Codes to generate a summary analysis report and map for evaluating potential territories. Easy-to-use portal for communicating network in-house, to outside third parties and even potential prospects!